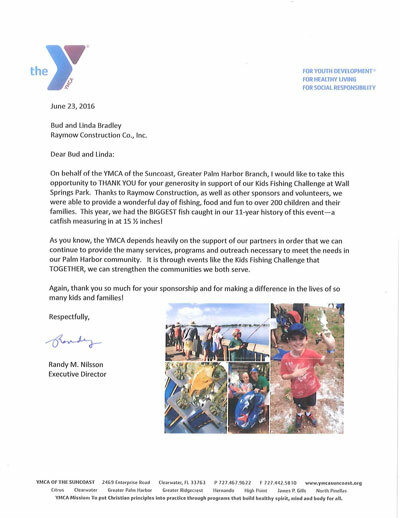 Raymow Construction happily sponsored the “11th Annual Kids’ Fishing Challenge” YMCA event on June 4th, 2016. The event had a wonderful turn out of over 200 kids and families. The event took place at the beautiful Wall Springs Park in Palm Harbor. The YMCA gave each kid angler a new rod and reel, tackle box, live bait, t-shirt, raffle ticket and lunch with their $15 entry. How can you beat that for a day of fun? Our Office Manager, Michele Boisvert and her daughter Ryelle (shown above) attended the event and caught one of the 3 trophies given on her pier. Congratulations Ryelle! We are so grateful we were able to support the YMCA’s 11th Annual Kids Fishing Challenge event as well as the children of our community.